On September 17, 2013, the PTDT Blog reached an incredible milestone: 1,000 views in just after 3 months of blogging and sharing an inside look into the company. In our summer hiatus, someone read about PTDT 1,000 times. Thinking about it makes our heads spin just a little. So thank you for reading and sharing our posts and offering comments. We hope you’re enjoying the chance to see how we make dances happen. A PTDT fan can come from anywhere in the world. The blog has recorded views from 20 countries so far, which makes sense since our dancers and audience members have friends and family all over the globe. As you might expect, the majority of our fans are in the United States. If we could view the results by state, most of the fans would probably be in California. Some fans even travel from a distance to see a show. Most recently, we know of 3 people driving from the LA area to see shows. If you’ve traveled to see us, let us know. 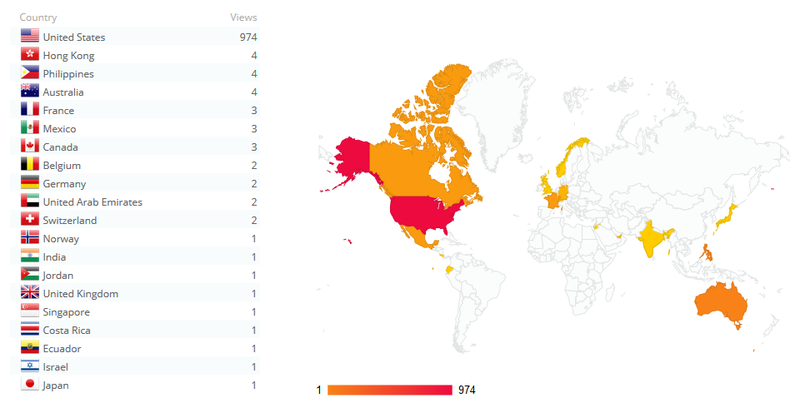 A map of which countries people were in when they read our blog, provided by WordPress’ statistics. PTDT fans range in age from 5 to 100 years old. Our audience is full just about every age group in our community. Not every show is for the younger crowd, though, but shows like the annual Davis Dance Project are perfect for kids, although adults enjoy this one as much as the kids. Our fans value our work with our community. The most popular post by far is Dorothy Ross’ Dance for Parkinson’s article. We have more articles planned to be written by participants in our education and community programs, so stay tuned. You also are curious to see the details of how our dancers make their magic happen. Our “What’s In Your Dance Bag” series is the second most popular kind of post. We’re not surprised by this at all because it’s human nature to be curious. Our dancers are enjoying getting to peek into each others’ bags as well. We’ve brought you 16 articles over the past 3 month and you collectively have read our blog posts more than 1,000 times. We want to keep giving you more of what you want, so tell us what you want to know. Leave a comment at the bottom of the page, on Facebook or Twitter, or send us an email letting us know what topics you want to read more about. Maybe you want to know about lucky charms, or pre-performance rituals, or what dancers like to eat, or…? This is awesome!!! Loved looking at the map! PreviousUshers: Superheros of the Theater! NextWhat’s In Your Dance Bag, Sara Delorena?